As easy as article writing – No kidding! Trust me, contrary to what many people think (especially readers), curating a good article is more than just getting a pen and a paper and scribbling away. Are you recently drawing on a blank more times than you can count? If so, you have just unlocked your genie from the bottle. Ever wondered why to some, article writing is actually a piece of cake? It wasn’t a piece of cake when they started. They had to learn the ropes – that’s why! Remember, before starting to put words down, you need to know who those words are designed for. This will help structure your tone, background and imagery. From the first sentence you write, the readers should be able to picture what to expect. But what you want to write also matters. 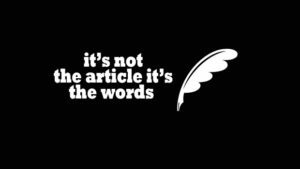 Article writing is about knowing the write facts to put down. A news article for example is highly dependent on this. This may be about something that happened in the recent past or expected to happen in the coming future. An editorial article will mean expressing your feelings about an idea or a debate and putting it out in a way intended to make your readers conform to it. How-to articles are informative and easy to understand. Profile articles, maybe from an interview, should cover your case study to the maximum without leaving out crucial info that readers are interested in. Either way, understand that every type of article will have its specific conditions. Why did you decide to write? Maybe you’ve been reading content from other writers about a topic and you feel they overlooked some areas, or is it because you think you have a better approach to the subject matter? If you can answer this, you are on the right lane of the highway. Drive on. After getting the basics, it’s now time to put it down. Headline your article in a way that captures the attention of the reader. The introduction can make or break your article. Make it captivating without losing essence of what the article is about. Move on to the body part where you put down your content. If your article could be captured in a single line, what would that line be? Zero in on that idea, outline the rest of the details in the correct order and finish off with a great ending. Give the readers something to remember your article by. But let’s face it, we all are not writers. Most of that could be why you are browsing through the content of this page. So why bother to get professional with the professionals a tap away? So that’s why we exist. To ensure your article writing experience rocks all the way.